Altogether the professional pension schemes of the liberal professional had in 2009 797.124 members with pension rights and paid pensions for about 143.162 persons. 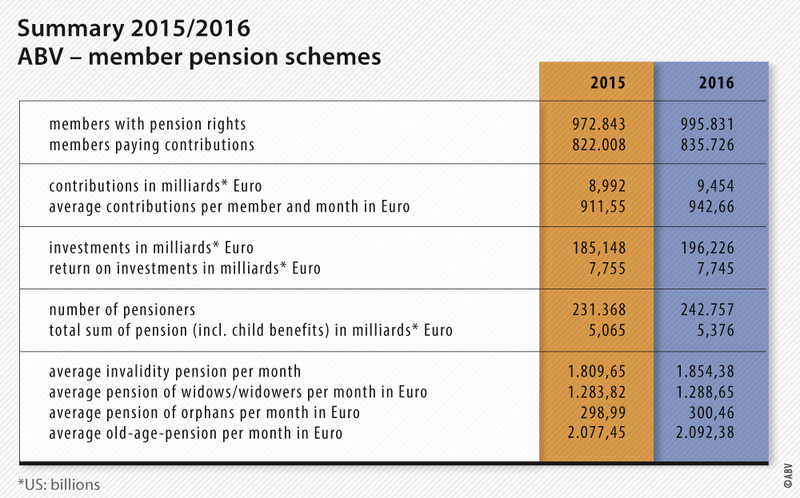 The average old-age-pension in 2009 was 1.944,10 € per month and the average invalidity pension 1.944,21 €. The professional pension schemes of the liberal professions provide their members with pensions for invalidity and for old-age when reaching the age of 65. Receiving pensions earlier or later ist possible. Furthermore there are pensions for survivors (widow, widower, orphans); as well as supporting payments for medical rehabilitation. Members or their survivors have a right on the pension benefits. A speciality of the professional pension schemes of the liberal profession is that concerning the provision for cases of invalidity there is no health check and furthermore there is, if any, only a very short qualifying period to be able to receive benefits. The invalidity would have been till the age of 60 sometimes even 65. By this method of calculation it is intended that even with a short time of payment of contributions there will be a pension that is high enough to keep up with the reached living standard. For the professional pension schemes of the liberal professions is characteristic that they are financed not by the method of "pay as you go" as it is used by the Social Insurance Pension Scheme. The pension Schemes of the liberal professions, however, are financed by a method that ist called open capitalization. Finally, the fact remains that: the classically "verkammert" professions, together with their provision schemes have created an old-age pension scheme tailor-made to their requirements. They had to do this as the State blocked their way to the State pension scheme in 1957.